Medical staffs that have been withdrawn after being deployed in district hospitals recently, are strategizing on how best they can drag the current president Peter Mutharika led government to a horrific earthly hell as a punishment over its lack of seriousness. Medical angry. 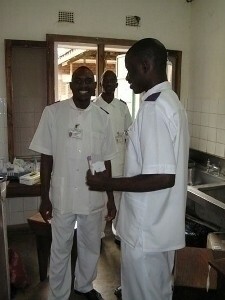 (Google images on Malawi nurses). One of the medics who complained being turned to a toy by the whole ministry of health told our reporter on Wednesday that of their group is planning to discipline government for its bad manners shown to intellectuals like them. “As intellectuals we deserve our respect and not such stupidity. Unless they justify their move with established reasons we will teach them. On this we are serious,” fumed one medic on condition of anonymity. When our publication went to press officials from the ministry of health as regards their preparedness on the impending horrific action against them, publicist Adrian Chikumbe stressed the need for the medics to understand that government is financially deficient. He went on to advise them that ‘war’ cannot solve problems but understanding is the only best permanent solutions. Chikumbe could however not hide the fact that his ministry was not that ready to deploy such medics because the treasury had nothing to pay them. “It best for them to understand the current state of affairs as regards our economy, In fact we withdrew them to map permanent solutions on how we can make them work to the best of their competence,” said Chikumbe. However when asked on when government is expected to be ready for their redeployment, he could not hide that it is so far unpredictable but was quick to assure them that soon after everything is ready they will be sent back to their respective districts hospitals. This is happening at the time the Mutharika government has taken along a large entourage to the United Nations Summit in the United States. He must go early before things getting worse why always them?? APM is th MOST INCOMPTENT & IRRESPONSIBLE leader Malawi hv seen. I secönd de idea 2 punsh this carefree president. Jegwe zamuvuta pa civo lero. Our fate is in the hands of who govern. apa ndiye opposite,eesh.ine ndikamva professor,professor ndikusaphunzira kwangaku ndimati ndiwozindikira,kodi nzeru nzachibadwidwe eti?komatu Bingu ananena kuti mphwanga ndiophunzira ali ndi chirichonse koma ndi ofoila saziwa kanthu.amatanthauza izi!.kkkkkkkbwambwa. Lack of seriousness by our gvt why now???? Jst tell our kids stop schoolin coz ophunzira adakwana!its expensve to educate children! This government has failed to deliver its promises.I think the zero deficit gonna kill us!!!!! Izizi ndiye nkhuyu zodya mwana zikupota ndi osavota omwe. Koma ndimmene zililimu eee zero aid itiphulisa ndi2. Ndikuona ng@ bomali likukanika kunena zoona zenizeni coz ku parliament bwana Goodal Gondwe amayankhula mwathamo nkumati ndalama zilipo and aliyense anaombera kuphanzi. Aphunzitsi nawonso ndi awo 2 years pakhomo. Am In Botswana working as a teacher from Malawi under the IPTE8 umbrella . Ndikuwauza ndikufuna certificate yanga akundikanizanso. I think Ministry of Health and Education should fold same string to choke this so called Dpp govt. I think impeachment is the best solution. !